Parody vs. Mash-Up -- Contrasting Waxwork II: Lost in Time with The X-File's "The Post-Modern Prometheus"
The parody is a relatively easy subgenre to create, because all the main story elements -- the characters (their attitudes, mannerisms, physical appearances), the dramatic situations, the cinematographic and audio styles -- are given to the parodist. Filmmakers and writers who tackle other genres must strive to create original characters and storylines -- an effort that does not burden parodists. 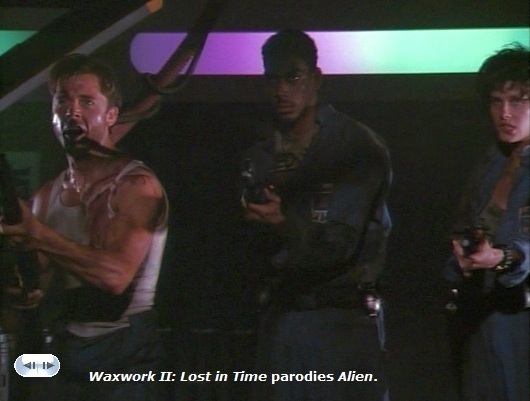 Waxwork II: Lost in Time (1991) demonstrates how easily a lazy filmmaker can create serviceable entertainment when parodying past films. By contrast, "The Post-Modern Prometheus" episode of TV's The X-Files shows how a filmmaker can build upon parodied elements to create something new and worthwhile. 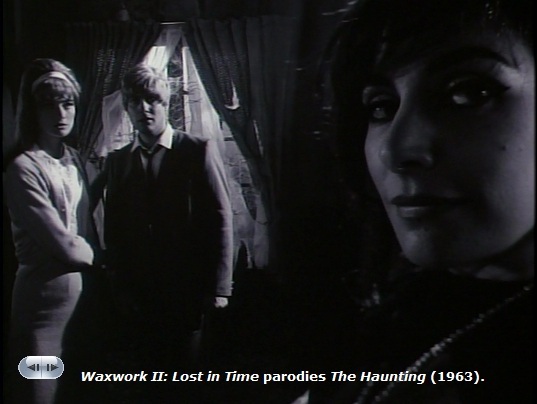 Waxwork II is a sort-of anthology film that parodies previous horror films. 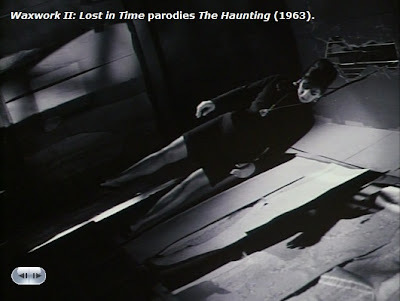 Its two lead characters, Mark and Sarah, enter a time warp that sends them through various scenarios, each evoking a horror film. At one point Mark finds himself with a group of ghost hunters, about to explore a haunted house. Horror fans will immediately recognize the tale as parodying The Haunting (1963). Waxwork II borrows the characters (as in the original, two men and two women), some of their names (both films contain an Eleanor), their attitudes (in both films, an assertive lesbian hits on a timid Eleanor; the lead investigator is a stuffy scientist), the black and white cinematography, and many situations (the laughing girl behind the door). 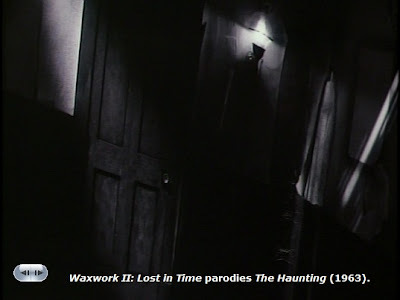 Waxwork II offers a few original bits, but with rare exception (John's exposed ribs), the film's original elements are unfunny. All the real humor derives from mimicking The Haunting. Thus, the parodied elements act as a crutch for an otherwise unfunny comedy. This slavish mimicry is true throughout Waxwork II. In another vignette, Sarah finds herself on an alien spacecraft. Very quickly, horror fans will recognize this as a parody of Alien (1979). The astronauts' uniforms resemble those in Alien. Sarah's hair mimics Ripley's hair. The astronauts are cynical and slovenly. And they're being pursued by an alien that bursts from people's chests. In both of the above vignettes, the audience's pleasure derives not from original characters or situations created by the filmmaker, but from the audience's sense of recognition at identifying which film this or that scene is lifted from. Of course, many comedies, not just parodies, derive laughs from a sense of recognition. But whereas other comedy subgenres must strive to create original characters and situations from which to draw that sense of recognition, parodies can all too easily get lazy and rely solely on a mimicry-based sense of recognition. All this is not to say that a slavish parody can't be entertaining -- just that it's a relatively easy and lazy form of filmmaking. By contrast, consider "The Post-Modern Prometheus" episode of TV's The X-Files. This TV episode simultaneously parodies multiple targets (not just one source film per vignette), then blends all these targets together, while also adding strong, original elements (e.g., series leads Mulder and Scully), to create something new that can stand on its own merits. 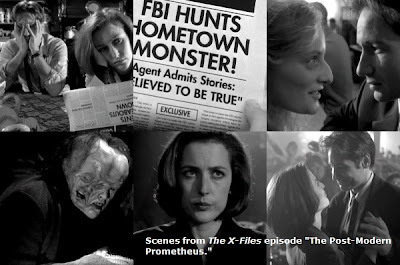 In "The Post-Modern Prometheus," Mulder and Scully are presented in 1930s black and white, in a story that borrows characters, situations, and themes from Frankenstein, The Elephant Man,The Mask, and Edward Scissorhands (particularly the episode's music -- check the YouTube excerpt below), and then juggles and mixes these disparate elements into an original, compelling, and cohesive story. By cohesive, I mean that the story is not just a disparate sequence of random parodied targets, but that all the elements -- Mulder and Scully's characters and attitudes, the original story elements, the parodied targets -- hold together (every element aesthetically and dramatically supporting the other elements) and create a unified story, one that is both unexpectedly funny and surprisingly poignant, while remaining true to Mulder and Scully's personalities. That is to say, "The Post-Modern Prometheus" works as an The X-Files episode. It does not feel as if Mulder and Scully are slumming in an unrelated "very special episode" because the writers couldn't think of an The X-Files episode that week. By contrast, Waxwork II feels unfocused and overlong. The main (original) characters are not interesting in themselves. They exist for no purpose other than to meander about as props in the increasingly dull and obvious parody vignettes. Tellingly, the film's most original vignette (the medieval story) is also its most tedious. Unlike Waxwork II, "The Post-Modern Prometheus" is not only a parody -- it's a mash-up. The former over-relies on borrowed elements as a crutch. The latter borrows smaller bits from many sources, adds large doses of originality, then mixes it into something wholly new. 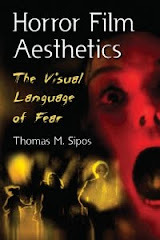 For more commentary about the relationship between horror and comedy, see Horror Film Aesthetics: Creating the Visual Language of Fear. This blog represents a continuing discussion of my views on horror, picking up from where the book left off. Emily Carmichael's horror comedy short film, The Ghost and Us, provides an excellent working example of the old screenwriting rule, Show, Don't Tell. In the film, Laura (Maria Dizzia), is newly married to a man she loves. Ben (Geordie Broadwater) loves her back. The problem is that Ben's ex-wife, Sena (Moira Dennis), won't let go. She keeps dropping by unannounced. Laura even finds Sena in the newlyweds' bedroom, whispering sweet nothings into Ben's ear. Laura can't even get a restraining order against Sena, because ... Sena is dead. The woman isn't just a stalker, she is a spiritual stalker. Despite its short length (11 minutes), The Ghost and Us provides story arcs for all three of its characters (wife, husband, dead wife). All three characters change in some small way by film's end. Especially admirable is the film's mid-point scene. As Syd Field teaches, the mid-point is where one should normally place a film's key turning point/incident -- an incident that affects the main characters' story arcs. The Ghost and Us not only achieves this, but it does so by showing, not telling. Prior to this mid-point scene, Laura and Sena have battled and bickered over Ben's affections. The mid-point scene begins after Laura and Sena have engaged in a temporary truce. Together, they share a snack in the kitchen. Girl stuff of the sort that bonds women. Then it becomes apparent that Sena cannot eat. She's a ghost. 1. It's conveyed visually. Rather than having the two women say nice things about each other, Carmichael shows Sena's inability to eat, and Laura's futile attempt to help her rival. 2. 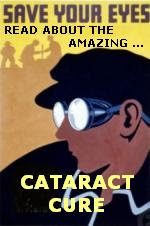 It's not overdone or overlong. The incident occurs. It's over. The women return to battle. (Albeit with a greater understanding of their situation, and of each other, hence, their emotional story arcs are advanced.) By not belaboring this scene, The Ghost and Us avoids the trap of cheap sentimentality. Actually, The Ghost and Us is admirable for just having a story and characters. All too many horror films these days are just an unmotivated succession of scenes which contain nothing but gore effects. Emily Carmichael is an NYU film school graduate whose work has screened at the Sundance Film Festival. She may be contacted at Kid Can Drive.